Life, the universe, government conspiracies, god, time travel. These are the big topics the boys are not afraid to address. Does our giant universe have room for life other than humans? It's the battle for the ultimate question: do aliens exist? Ryan says they absolutely do not. Today, the boys get down to the nitty-gritty personal life of one of their own. Who else better to change their livelihood than our own judge, Mike? Let the boys determine one of life’s simple problems for you this time around. It’s a question that separates even the most amiable of us: paper or plastic? The boys throw a surprise switcheroo as Mike and Producer Grant take the reigns in this episode. 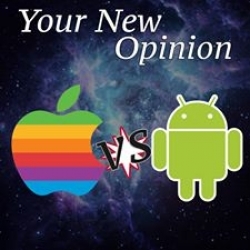 Another important topic is discussed, as Grant takes the side of Androids and Mike argues for Apple. These two powerhouses come to blows as they try to settle the better smartphone debate.